A Militia is an organization of citizens prepared to provide defense, emergency, or paramilitary service, or those engaged in such activity. Militias can be government sanctioned or independent organizations. The legality of such organizations varies by country, as does the role they have played in the founding of different countries. Militias, being composed of civilians rather than professional soldiers, vary in their military training and have historically been found inadequate to their appointed task of defending their country against foreign attack. In some countries, such as Switzerland, however, the militia forces are trained to a high degree and constitute the main bulk of armed forces available for defense. In many countries, the government has developed a National Guard (U.S.), Army Reserve (Australia), or Territorial Army (UK) from their militia forces, which serve both as a reserve pool for military forces as well as emergency service for disaster relief. In this way, the militia supports the society without requiring its members to dedicate themselves to professional military careers, fulfilling both the purposes of protection against an enemy and responding to a catastrophic situation, providing aid to persons and communities who have suffered from some form of disaster. In its original sense, therefore, militia meant "the state, quality, condition, or activity of being a fighter or warrior." It can be thought of as "combatant activity," "the fighter frame of mind," "the militant mode," "the soldierly status," or "the warrior way." Defense activity, as well as those engaged in it, when it is defense of the public, its territory, property, and laws. The entire able-bodied male population of a community, town, or state, available to be called to arms against an invading enemy, to enforce the law, or to respond to a disaster. A similar common law provision, the posse comitatus, exists in jurisdictions with English judicial origin for law enforcement authority to conscript from the male population to assist with keeping the peace, law enforcement, and so forth. An official reserve army, composed of citizen soldiers, also called an Army Reserve, National Guard, or State Defense Forces. The national police forces in Russia, and other former CIS countries, or the former Soviet Union: Militsiya. In any of these cases, a militia is distinct from a regular army. It can serve to supplement the regular military, or it can oppose it, for example to resist a military coup. In some circumstances, the "enemies" against which a militia is mobilized are domestic political opponents of the government, such as strikers. In many cases the role, or even the existence of a militia, is controversial. For these reasons, legal restrictions may be placed on the mobilization or use of militia. In common usage, a "militia" is a body of private persons who respond to an emergency threat to public safety, usually one that requires an armed response, but which can also include ordinary law enforcement or disaster responses. The act of bearing arms changes the status of the person, from peaceful citizen, to warrior citizen. The militia is the sum total of persons undergoing this change of state. There is no minimum size to militia, and a solitary act of defense, including self-defense, can be thought of as one person calling up himself to defend the community, represented by himself or others, and to enforce the law. An example of this type of action is found in the citizen's arrest. Militia service is distinguished from military service in that the latter is normally a commitment for a fixed period of time, probably at least a year, for a salary. Militia persons are normally expected to provide their own weapons, equipment, or supplies, although they may later be compensated for losses or expenditures. The time period in which people are "called up" to militia status is not fixed, but rather depends on the duration of the emergency necessitating the mobilization. Oftentimes, governments will sponsor militias. Their reasons for doing so vary. Some governments use militias as a step between police and the army, much like the role that the National Guard plays in the United States. Other governments use militias to undertake work seen as controversial or illegal. These militias have been called "death squads" and used to accomplish some illicit end of those in power. 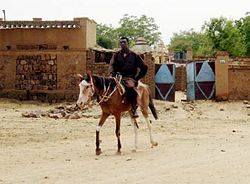 An example of this type of militia would be the Janjaweed in Sudan in the 1990s and 2000s, who were sponsored by the Arab government to oppress the African peoples of the country. Private militia groups are collections of like-minded residents of an area. In the U.S., traditionally, they are organized into county units with the county sheriff serving as county militia commander, if he is willing, or election of a commander by those who attend musters if not. Most private militia groups are armed or espouse the use of arms, however some groups (mostly U.S. groups) espouse political protest and more peaceful means of bringing about political change, and take up arms only for traditional or ideological reasons, or as a protest against restrictions on such activities. 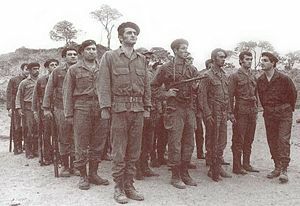 Left-wing militias generally consider themselves to be freedom fighters and espouse various causes, from national liberation movements in regions under foreign occupation, to civil insurrection—as with, for example, the Red Brigades—and guerrilla activity in Central America. As their funding and armament in the twentieth century came almost entirely from the Soviet Union, Maoist China, and other Communist states, many of these organizations declined in their activities during the 1990s, as these governments fell or changed their nature. The original meaning of the Latin word is "military activity," or, since the ancient Romans had the same people fight crime or respond to disasters, "defense activity." In the idiom of English during the eighteenth century, the same word would often be used for an activity and for those who engage in it, so "militia" meant both defense activity and those who engage in it, whether as individuals or in concert with others. In later times the term has come to be used mainly to refer to armed groups, but it would be a mistake to use it that way in discussions of the concept in the U.S. Constitution. Militia was an alternative name for the Citizens' Military Forces (CMF), the reserve units of the Australian Army between 1901 and 1980. After Australian federation, the six former colonial militias were merged to form the CMF. Initially the CMF infantry forces formed the vast bulk of the Australian Army, along with standing artillery and engineer units. The Defence Act of 1903 granted the Australian federal government the powers to conscript men of military age for home defense. However, these powers were unpopular and were used only for short periods at a time. The government was also forbidden by law from deploying the CMF outside Australian territories, or using it in strikes and other industrial disputes. As a result of the ban on foreign service, during World War I and World War II, all-volunteer Australian Imperial Forces were formed for overseas deployment. CMF units were sometimes scorned by AIF soldiers as "chocolate soldiers" or "chockos," because "they would melt under the pressure" of military operations; or in an alternative version of the story of the origin of this term, as a result of the 1930s uniforms of Militia soldiers, these soldiers were considered by AIF volunteers and some civilians as soldiers only for show, like the soldiers in garish nineteenth century dress uniforms shown on tins of chocolates that were commonly sold in Australia in the 1930s, hence the name "chocolate-tin soldiers" for Militia members. Nevertheless, some militia units distinguished themselves in action against Japan during the Pacific War, and suffered extremely high casualties. In mid-1942, militia units fought in two significant battles, both in New Guinea, which was then an Australian territory. The exploits of the young and poorly trained soldiers of the 39th (Militia) Battalion during the rearguard action on the Kokoda Track remain celebrated to this day, as is the contribution of the 7th Brigade at the Battle of Milne Bay. Later in the war, the law was changed to allow the transfer of militia units to the 2nd AIF; of these militia units, 65 percent of their personnel had volunteered for overseas service. Another change allowed militia units to serve anywhere south of the Equator in South-East Asia. Consequently, they also saw action against Japanese forces in the Dutch East Indies. In addition to the CMF, the Volunteer Defence Corps, a volunteer force modeled on the British Home Guard, was formed in 1940, and had a strength of almost 100,000 men across Australia at its peak. After the war, CMF units continued to form the bulk of the peacetime army, although the creation of standing infantry units—such as the Royal Australian Regiment—from 1947, meant that the regular army grew in importance. By 1980, when the name of the CMF was changed to the Army Reserve, the regular army was the more significant force. Australian Reservists have a comparatively high level of commitment, with an expected obligation of up to four nights and two full days per month, alongside a two week annual course. Since September of 2006, Reservist salaries have been streamlined with those of regular forces as a reflection of overall higher standard of training. This initiative shows that since 1975, there are now many positions for which there is little training gap at all between Reservists and Permanent Force members. In Canada, the title "militia" historically referred to the land component of the armed forces, both regular (full time) and reserve. In 1940, the Permanent Active Militia and Non-Permanent Active Militia were renamed to become the Canadian Army. The term Militia continued from then to the present day to refer to the part-time army reserve component of the Canadian Forces. Currently, militia troops usually train one night a week and every other weekend of the month, except in the summer; summertime training may consist of courses, individual call outs, or concentrations (unit and formation training of 1 to 2 weeks' duration). In addition, primary reserve members are increasingly used for voluntary service as augmentation to the regular force overseas—usually NATO or United Nations missions. Most Canadian cities have one or more militia units. PRC's Militia, a mass force engaged in daily production under the leadership of the Communist Party of China (CCP), forms part of the Chinese armed forces. Under the command of the military organs, it undertakes such jobs as war preparation services, security and defense operation tasks, and assistance in maintaining social order and public security. The next notable militia was organized and led by Joan of Arc, until her capture and execution in 1431. This settled the succession to the French crown and laid the basis for the formation of the modern nation of France. During the Franco-Prussian War, the Parisian National Guard, which was founded during the time of the American Revolution, engaged the Prussian Army and later rebelled against the Versailles Army under Marshall McMahon. During World War II, under German occupation, militia usually called the French Resistance emerged to conduct a guerrilla war of attrition against German forces and prepare the way for the D-Day Allied Invasion of France. The name Freikorps (German for "Free Corps") was originally applied to voluntary armies. The first freikorps were recruited by Frederick II of Prussia during the Seven Years' War. The freikorps were regarded as unreliable by regular armies, so that they were mainly used as sentries and for minor duties. However, after 1918, the term was used for far-right paramilitary organizations that sprang up around Germany as soldiers returned in defeat from World War I. They were one of the many Weimar paramilitary groups active during that time. They received considerable support from Gustav Noske, the German Defence Minister who used them to crush the Spartakist League with enormous violence, including the murders of Karl Liebknecht and Rosa Luxemburg on January 15, 1919. They were also used to put down the Bavarian Soviet Republic in 1919. They were officially "disbanded" in 1920, resulting in the ill-fated Kapp Putsch in March 1920. Some members and, indeed, leaders of the Nazi Party were members of a Freikorps, including Ernst Röhm, head of the Sturmabteilung or SA, and Rudolf Höß, the Kommandant of Auschwitz. The Einwohnerwehr was active in Germany from 1919 to 1921, as a paramilitary citizens' militia consisting of hundreds of thousands of mostly former servicemen. It was formed by the Prussian Ministry of the Interior on April 15, 1919, for the purpose to allow citizens to protect themselves from looters, armed gangs, and revolutionaries. The Einwohnerwehr was under the command of the local Reichswehr regiments and which supplied its guns. In 1921, the Berlin government dissolved the Einwohnerwehr. Many of its members went on to join the Nazi Party. The Basij militia, founded by Ayatollah Ruhollah Khomeini in November 1979, is comprised of 90,000 regular soldiers, and 300,000 reservists and ultimately draws from about 11 million members. It is subordinate to the Army of the Guardians of the Islamic Revolution in Iran. The earliest historical record of militia is found in the Old Testament and particularly the Book of Judges, when the Israelites fought as militia against threatening neighboring tribes. A prominent instance of that was the militia led by Deborah against the Caananites. In modern times there is a universal military service requirement for male Israeli citizens that leaves most of them in the reserves of the Israeli Defense Forces, authorized to keep certain military weapons in their homes and workplaces. Ancient Rome required her male citizens to serve as needed for defense, law enforcement, and disaster response, the activity from which the term "militia" is derived. Roman militia united Italy under Roman rule and fought the Punic Wars against Carthage. The practice of militia was replaced by a standing army largely through the reforms of Gaius Marius. In the Medieval and Renaissance period while Italy was divided into contending city-states, militia were important for the survival of such states. Machiavelli wrote in his Discourses on Livy that militia were critical for the survival of a free republic. The Italian patriot Garibaldi organized and led various militia from about 1848 until Italy was united in 1870, sometimes acting with official sanction and sometimes independently. An exercise near Glarus, Switzerland. One of the most famous and ancient militias is the Swiss Armed Forces. A unique institution somewhere between a militia and a regular army, it is equipped with mostly modern, sophisticated, and well-maintained weapons systems and equipment. Switzerland long maintained, proportionally, the second largest military force in the world, a militia of some 33 percent of the total population. Article 58.1 of the 1999 Swiss constitution provides that the armed forces is "in principle" organized as a militia, implicitly allowing a small number of professional soldiers. In 1995, the number of soldiers was reduced to 400,000 (including reservists, amounting to some 5.6 percent of the population) and again in 2004, to 200,000 (including 80,000 reservists, or 2.7 percent of the population). However, the Swiss Militia continues to consist of the entire adult male population, with voluntary participation by women and children, required to keep an automatic rifle and ammunition at home and to periodically engage in combat and marksmanship training. The obligation to serve in the militia in England is enshrined in common law, and dates back to Anglo-Saxon times, when the militia was known as the fyrd. (The definition of a freeman was that he was "mootworthy and fyrd worthy.") The common law tradition stated that all males between fifteen and fifty were liable to be called out and embodied in one of two forces. The first was the posse commitatus, an ad-hoc body gathered together by a law officer to apprehend lawbreakers, and the second was the militia, a military body required to preserve internal order or defend the locality against an invader. It should be noted that the latter could be embodied only by a royal warrant. 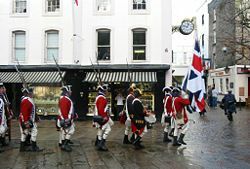 With the decay of the feudal system and the military revolution of the sixteenth century, the militia began to become an important institution in English life. It was organized on the basis of the shire county, and was one of the responsibilities of the Lord Lieutenant, a royal official (usually a trusted nobleman). Every parish furnished a quota of eligible men, whose names were recorded on muster rolls. Likewise, each household was assessed for the purpose of finding weapons, armor, horses, or their financial equivalent, according to their status. The militia was supposed to be mustered for training purposes from time to time, but this was rarely done. The militia regiments were consequently ill-prepared for an emergency, and could not be relied upon to serve outside their own counties. The Militia Act of 1757 created a more professional force. Better records were kept, and the men were selected by ballot to serve for longer periods. Proper uniforms and better weapons were provided, and the force was "embodied" from time to time for training sessions. Although muster rolls were prepared as late as 1820, the element of compulsion was abandoned, and the militia was transformed into a volunteer force. It was intended to be seen as an alternative to the army. Men would volunteer and undertake basic training for several months at an army depot. Thereafter, they would return to civilian life, but report for regular periods of military training (usually on the weapons ranges) and an annual two week training camp. In return, they would receive military pay and a financial retainer, a useful addition to their civilian wage. Three units still maintain their militia designation in the British Army, two in the Territorial Army and one in the Army Cadet Force. These are the Royal Monmouthshire Royal Engineers (formed in 1539), the Jersey Field Squadron (The Royal Militia Island of Jersey) (formed in 1337), and the Royal Alderney Militia (created in the thirteenth century and reformed in 1984). Additionally, the Atholl Highlanders are a (ceremonial) private army maintained by the Duke of Atholl—they are the only legal private "army" in the United Kingdom. There is a long history of militia in the United States, starting during the colonial era, with the colonial militias drawn from the body of adult white male citizens of a community, town, or local region. Colonial militia served a vital role in the French and Indian Wars and to a lesser extent the United States Revolutionary War. Militia service shifted from colonial control to state control with the creation of the United States in 1776. Regulation of the militia was codified by the Second Continental Congress with the Articles of Confederation, in conjunction with the creation of a regular army, and a trend of shifting military power from the militia to the regular army. With Constitutional Convention of 1787 and Article 1 Section 8 of the United States Constitution, control of the army and the power to call up the state based militia was transferred to civilian control through the federal congress. Two years later, with the Bill of Rights in 1789, the congress provided that the federal government could not infringe on the rights of the states to maintain their militia by ratification of the Second Amendment. During the nineteenth century, each of the states maintained their militia differently, some more than others. Also, prior to the Civil War, militia units were sometimes used in southern states for slave control. During Reconstruction after the Civil War, Republican Party aligned militia units comprised almost entirely of freed slaves were deployed to maintain order in the former Confederate states, which caused in resentment among Southern Whites. Also, during this century, when the militia was called up to fight the War of 1812, the Civil War, and the Spanish American War, the militia units were found to be unprepared, ill supplied, and at first unwilling. 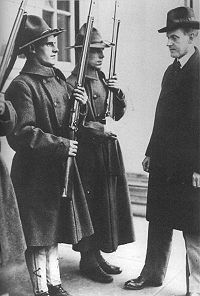 The Militia Act of 1903 reorganized the militia. Organized units were created from portions of the former state guards and became state National Guard units. Some states later created State Defense Forces for assistance in local emergencies. Formally, an unorganized militia comprised of the remainder of able bodied men still remains. Privately organized citizens-militias blossomed in the mid 1990s. These Constitutional Militia Movements, consisting of paramilitary militia groups not affiliated with any government organization though not necessarily illegal, are often suspicious of activities of government. These groups espouse a strict construction of the U.S. Constitution, especially the Second Amendment, according to their understanding of the intent of the Founding Fathers of the United States, with particular regard to the right to keep and bear arms and a view that the people have a duty to be armed as deterrence against governmental tyranny. These Constitutional Militias train in the proper and safe use of firearms so that they may be effective if called upon by the federal congress to uphold liberty, protect the people in times of crisis (disasters such as Hurricane Katrina), or to defend against invasion and terrorism. U.S. Constitution, Art. I Sec. 8 Cl. 15 & 16. ↑ Human Rights Watch, Sudan: New Darfur Documents. Retrieved October 6, 2007. ↑ Minister of Defence, Increased Pay for ADF Reservists. Retrieved October 17, 2007. ↑ english.gov.cn, The Components of the Armed Forces, People's Republic of China. Retrieved July 29, 2007. ↑ Bruce Campbell, The Sa Generals and the Rise of Nazism (University Press of Kentucky, 1998, ISBN 0813190983). ↑ www.radix.net, German Police Unit Marks, 1920-1937. Retrieved October 20, 2007. ↑ Garry Wills, A Necessary Evil, A History of American Distrust of Government (New York: Simon & Schuster, 1999, ISBN 0684844893). ↑ Bruce Catton, The Civil War (Mariner Books, 2004, ISBN 0618001875). ↑ William H. Sumner, An Inquiry Into the Importance of the Militia to a Free Commonwealth (Cummings and Hillard, 1823). ↑ Mark Pitcavage, "Camouflage and Conspiracy: The Militia Movement From Ruby Ridge to Y2K," American Behavioral Scientist, 44 (6): 957-981. Abanes, Richard. 1996. American Militias: Rebellion, Racism & Religion. Intervarsity Press. ISBN 0830813683. Cornell, Saul. 1996. A Well-Regulated Militia: The Founding Fathers and the Origins of Gun Control in America. Oxford University Press. ISBN 0195147863. Mulloy, Darren. 2004. American Extremism: History, Politics and the Militia Movement. Routledge. ISBN 0415326745. Shultz, Richard. 2006. Insurgents, Terrorists, and Militias: The Warriors of Contemporary Combat. Columbia University Press. ISBN 0231129823. This page was last modified on 27 October 2014, at 15:46.